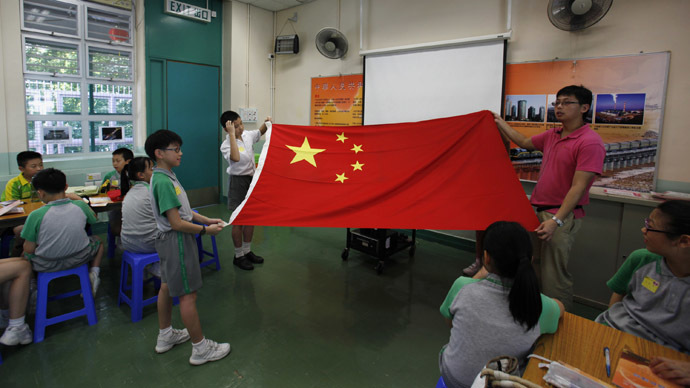 Chinese propaganda is infiltrating British primary and secondary schools under the guise of government-funded Mandarin lessons, a report by campaigners alleges. The Chinese government provides hundreds of thousands of pounds and more than 90 teachers to schools across the UK as part of a Chinese-language teaching project. An investigation by campaign group Free Tibet found that British educational institutions are hosting so-called Confucius Classrooms without prior discussion of their content. Critics argue the language classes present students with a “whitewashed” view of China’s government and human rights record. Freedom of Information (FoI) requests revealed that in 37 out of 95 schools, governors have not been critical of Confucius Classrooms before approving their activity in the school. Out of 80 FoI requests, Free Tibet discovered only one single school governor had raised concerns about the program during a meeting. One FoI request revealed China currently injects $10,000 annually into cash-strapped British schools after Confucius Classrooms’ budget and plan have been rubber stamped by the project’s headquarters in Beijing. In addition to paying the salaries of Mandarin teachers, The Confucius Institute – also known as Hanban – pays for teaching resources and even subsidizes school trips to China. Hanban offered a total 9,000 Chinese courses for 260,000 students around the world in 2009. The program says it is meeting the “sharp increase” in global demand for Mandarin lessons, while also promoting Chinese culture abroad. Critics argue it also plays a part in Chinese soft power, seeking to alter Western attitudes to a country which is notoriously strict on censorship and freedom of speech. Li Changchun, a retired senior government official and Politburo member, described it “an important part of China’s overseas propaganda set-up,” according to the Economist. Mandarin teachers, who are recruited from the Hanban headquarters in Beijing, are vetted by the Ministry of Chinese Education before being dispatched abroad. “Hanban teachers present students with an exclusively positive view of China and prevent them learning about the lives of Chinese people in an authoritarian state and about wider issues such as democracy, human rights, Hong Kong and Tibet,” the group said. Free Tibet has sent a dossier to Confucius Classroom schools in the UK which outlines the “risks” associated with hosting the Mandarin teachers. The organization asks schools to demonstrate how they are offering a balanced education which does not lead to a “whitewash” of the government’s human rights record in China and Tibet. “However well-intentioned [schools] may be in hosting Confucius Classrooms, they must understand that China’s authoritarian government is seeking to control what British children learn about China,” Free Tibet Director Eleanor Byrne-Rosengren said. The UCL Institute of Education, which hosts the Confucius Institute for England, said it is still considering a number of FoI requests from Free Tibet and could not comment on the concerns until the requests have been resolved. “Schools employ and fund teachers of Mandarin Chinese on the same terms as their other language teaching staff,” the institute said.